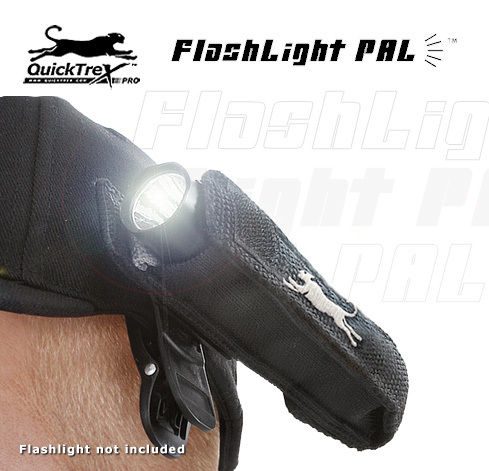 No more holding a flashlight in your mouth or scrunching it between your neck and your shoulder. No more fumbling in the dark. No more being without light wherever and whenever you need it. Compatibility: The Flashlight PAL™ was designed mainly for LED Flashlights ranging from: Range of Thickness from 0.75" (19mm) to 1.5" (38mm), and a Length from 4" (101 mm) to 9" (229mm) or more. Notes on Usage: Tuck in the top flap on the inside of the pouch when using the flashlight. When the flashlight is not in use, we recommend keeping this flap closed (even though the side elastic panels will otherwise hold it securely), for additional security under certain conditions like jogging or working on heavy machinery. Be aware that flashlights can get hot so guard your face from touching the flashlight when used on a shirt collar or otherwise close to other parts of your body. Lower Flap: The lower flap serves two purposes. It makes it possible to turn on flashlights that have a rear click switch without removing the flashlight from the pouch. Secondly, you can also open the lower flap when you are using flashlights that are in excess of 6" in length. Tip: Always have an extra set of batteries on hand for emergencies. Hazardous Conditions: Always work safely and use proper safety equipment (like eye protection) when working under potentially hazardous conditions. Be aware that flashlights can get hot so guard your face from touching the flashlight when used on a shirt collar or otherwise close to other parts of your body.